Popularly referred to as dwarf jade plant or elephant bush, this South African native is known by local residents as “Spekboom”. Elephants regularly graze the plant, as it’s able to retain water and remain succulent even during very hot, dry periods. Plants do very closely resemble that of a jade plant, with reddish brown stems and small succulent leaves. Plants are cold hardy to about 25° F and are often grown as houseplants or patio plants in colder climates. In warm climates, they can be planted in sunny or shady spots in the landscape, where they can grow as tall as 12-feet. In urban cultivation, they most often reach about 6-feet tall. In warm climates, plants can quickly develop a thicket-like growth habit, which makes them useful as a privacy screen. You can keep plants shaped to size with regular pruning. Plants can also be displayed in containers. 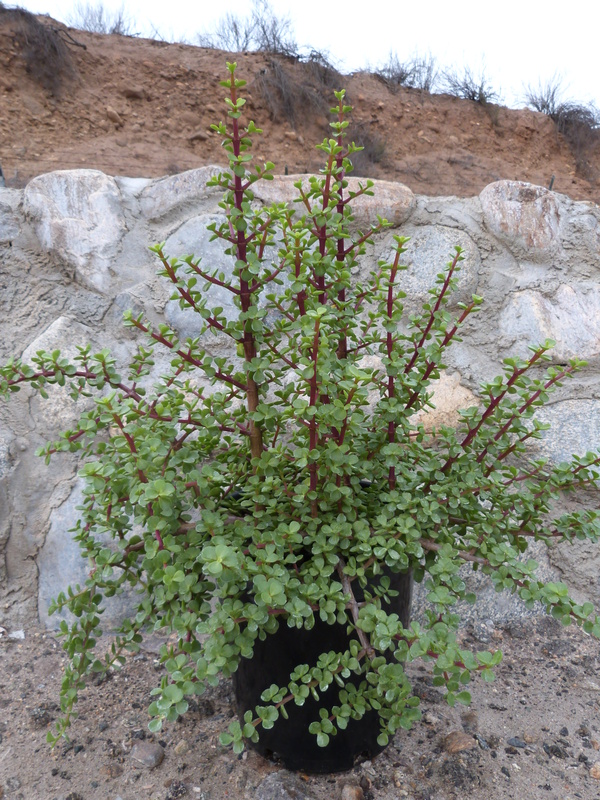 Elephant bush is excellent for controlling soil erosion and improving air quality. They prefer loose soil and good air circulation. While not common, plants can produce tiny lavender blooms; conditions must be dry in order for flowering to occur in late-spring to early summer. Very low-maintenance, water-wise succulent.